This week ITV Studios, the international distributors of Poldark, are promoting the show at MipCom, a global entertainment market where TV programmes are bought and sold. Aidan Turner as Ross graces the 'Welcome' page of ITV Studios Programme Highlights 2016, with details of the drama appearing a few pages later. ITV Studios have a rather neat sales 'house' at MipCom this year: the photos of the 'house' being constructed and of it complete are via DesignScene WW. 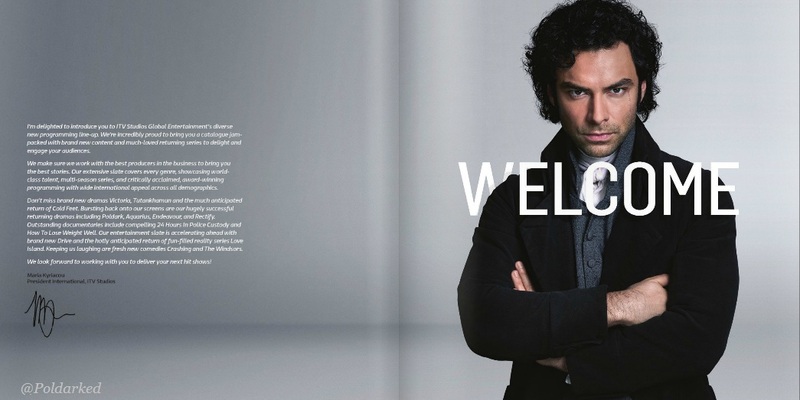 Here's wishing ITV Studios a terrific week with their sales of Poldark.